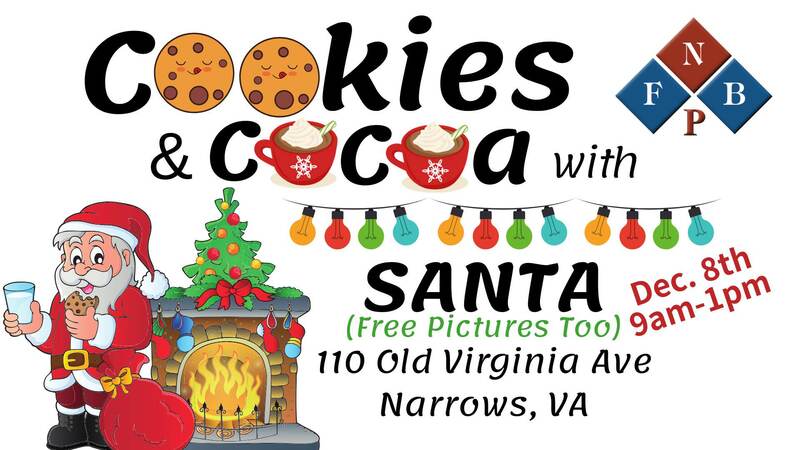 The First National Bank of Peterstown (FNBP), Narrows branch presents Cookies & Cocoa with Santa on Saturday, December 8, 2018. Join us at FNBP Narrows for some community Christmas cheer with cookies, cocoa and pictures with Santa. To view the event flyer, visit: https://i.imgur.com/ysSizup.jpg. For more information, visit: https://www.facebook.com/FNBPCommunityBank or https://www.facebook.com/events/187965455424006/ or http://www.fnbp.com/locations.html or call 540-358-2505.